Astronomers studying the most distant quasar yet found in the Universe have discovered a massive reservoir of gas containing atoms made in the cores of some of the first stars ever formed. The carbon-monoxide gas was revealed by the National Science Foundation's Very Large Array (VLA) and the Plateau de Bure radio interferometer in Europe. The gas, along with the young galaxy containing it, is seen as it was when the Universe was only one-sixteenth its current age, just emerging from the primeval "Dark Ages" before light could travel freely through the cosmos. "Our discovery of this much carbon monoxide gas in such an extremely distant and young galaxy is surprising. It means that, even at a very early time in the history of the Universe, galaxies already had huge amounts of molecular gas that would eventually form new generations of stars," said Chris Carilli, of the National Radio Astronomy Observatory (NRAO) in Socorro, New Mexico. The distant galaxy, dubbed J1148+5251, contains a bright quasar powered by a black hole at least a billion times more massive than the Sun. The galaxy is seen as it was only 870 million years after the Big Bang. The Universe now is 13.7 billion years old. J1148+5251 would have been among the first luminous objects in the Universe. The original atoms formed in the Universe within the first three minutes of the Big Bang were only hydrogen and helium. Carbon and oxygen -- the atoms making up carbon monoxide -- had to be made in the thermonuclear furnaces at the cores of the earliest stars. "The carbon and oxygen atoms in the gas we detected were made by some of the first stars ever formed, only about 650 million years after the Big Bang. In the next 200 million years or so, those stars -- probably very different stars from those we see today -- exploded as supernovae, spreading the carbon and oxygen out into space. Those atoms then cooled and combined into the carbon monoxide molecules we detected with our radio telescopes," said Fabian Walter, a Jansky Postdoctoral Fellow at the NRAO. Walter is lead author of a research paper in the July 24 issue of the scientific journal Nature, and, with Carilli and K.Y. Lo of NRAO, did the VLA observations. Frank Bertoldi of the Max-Planck Institute in Germany and Pierre Cox of the Institute of Space Astrophysics in Orsay, France, led the collaborators using the Plateau de Bure telescope. The discovery gives scientists a tantalizing direct view of one of the earliest galaxies in the young Universe, and raises questions about the nature of the first stars and how galaxies and quasars formed. "The Universe in which this galaxy existed is a very different Universe from the one we know today," Walter said. For about 300,000 years after the Big Bang, the Universe was filled with very hot gas which eventually became protons and electrons. Then, through expansion, the Universe cooled and the protons and electrons combined into neutral atoms that absorbed light and other forms of electromagnetic radiation. This period, from 300,000 years after the Big Bang, until a few hundred million years later when the first stars and galaxies began forming, is known as the cosmic Dark Ages. As the first stars and galaxies formed, intense radiation from the stars began to break apart -- or ionize -- the neutral atoms, allowing light once again to pass. As each new star's radiation ionized interstellar atoms, it formed a transparent "bubble" in the opaque Universe. The Universe began to resemble a cosmic Swiss cheese, with the holes growing larger until, about a billion years after the Big Bang, the holes all met each other and the Universe became fully transparent once again. This period is known as the Reionization Era of the Universe. In fact, combining the radio observations with data from optical telescopes shows that the transparent "bubble" around J1148+5251 is about 30 million light-years in diameter. "This is direct evidence that we are seeing this object helping reionize the Universe," Walter said. The amount of molecular gas in the galaxy -- a mass more than 10 billion times that of the Sun -- tells the scientists that things were happening quickly in the early Universe. "This is as much mass as we see in big galaxies today, and it had little time, astronomically speaking, to accumulate," said Carilli. Also, the most popular theory for how big galaxies formed is that they were built up over long spans of time by multiple mergers of smaller galaxies. "That's why it's so surprising to see such a massive galaxy so early in the Universe," said Walter. Studies of J1148+5251 and other distant objects yet to be discovered will help scientists find the answers to their questions about the Universe's early stars and galaxies. The radio observations of J1148+5251 gave astronomers a look at the galaxy itself, Walter emphasized, while optical telescopes showed only light coming from the bright quasar "engine" at the galaxy's core. Walter added that more VLA observations now being planned are aimed at producing an image of the young galaxy. In addition, Walter also looks forward to studying other objects deeper into the era of reionization, both with the expanded VLA (EVLA) and with the Atacama Large Millimeter Array (ALMA), a joint North America-Europe project to be built in Chile. "With the EVLA and ALMA, we will be able to study the structures and dynamics of similar systems in great detail," Walter said. J1148+5251 was discovered by the Sloan Digital Sky Survey, using a 2.5-meter optical telescope at Apache Point, NM, earlier this year. 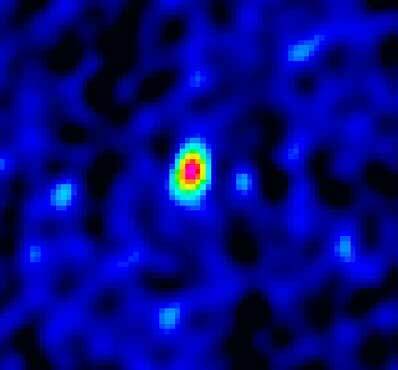 At a distance of more than 12.8 billion light-years, it is the most distant quasar yet found in the Universe. Followup observations at the W.M. Keck Observatory in Hawaii showed a clear signature of light absorption indicating that the object is seen at the end of the reionization era. This signature, found using a spectroscope to analyze light from the object, is known as the Gunn-Peterson Effect, after James Gunn and Bruce Peterson, who predicted it in 1965. The carbon monoxide gas was found using radio telescopes that detected radio waves emitted by the gas molecules. The wavelength of this radio emission was greatly increased by the Doppler Effect produced by the expansion of the Universe. For example, at the great distance of J1148+5251, waves that left the galaxy with a length of less than one millimeter were received by the VLA at a wavelength of more than six millimeters. In addition to Walter, Carilli and Lo, who used the VLA to observe J1148+5251, other team members led by Bertoldi and Cox used the Institute of Millimeter Radio Astronomy's (IRAM) Plateau de Bure radio interferometer in France. These included Roberto Neri of IRAM; Alain Omont of the Paris Institute of Astrophysics; and Karl Menten of Germany's Max Planck Instutute for Radioastronomy. Xiaohui Fan of the University of Arizona's Steward Observatory and Michael Strauss of Princeton University were the Sloan Digital Sky Survey collaborators on the Nature paper.